Note: This is going to be a long one. Sorry. Maybe the pretty pictures will make up for it. Instead of breaking this trip up into days, I am just going to hit on the different things we did because you don't really want to hear about all of the 8 days. I'll give you a glimpse of what they looked like anyway: wake up, eat bagels, go skiing, fall, eat lunch, ski more, fall some more, rest back in hotel, dinner, sleep. Repeat. Park City is an absolutely beautiful place. 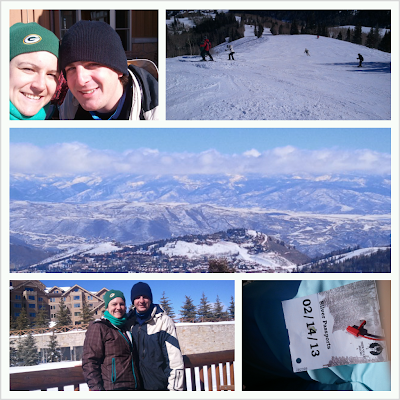 Matt and I have taken two ski trips to Colorado and skied at three different resorts. Although, Matt has been to Colorado at least two more times and skied at several more resorts without me (I know, how rude!). When we were looking at options this time we decided to go with Park City for a few reasons. Park City is only about 40 minutes from the Salt Lake City airport whereas most Colorado resorts are 2+ hours from Denver. In the past, we've always driven to Colorado (since we were poor college kids) but this time we wanted to spend more time skiing and less time traveling. This helped us avoid renting a car and instead used a shared ride service from the airport to our hotel; rental car fees were outrageous since neither of us are yet 25 years old. Park City has three (3!) resorts that are all easily accessible from the free city bus system. Plus Salt Lake City has at least 5 more ski resorts that you can easily get to from Park City. We wanted to try out some new ski places and Matt felt like he had been there, done that with Colorado. I've been skiing on an old pair of Matt's skis for the past few years. Since they used to be Matt's, they were much too long for me and they are racing skis which isn't the best type of ski for me. I ended up buying a new pair of skis the weekend before this trip. They are twin tips and they are the right height for me. I was a little hesitant about the pink color, but I think they look pretty snazzy. After skiing on them, I am even more in love with them. Park City has a great promotion going with which you can ski the same day you fly in with a boarding pass and an out-of-state ID. All you need to do is sign-up in advance. Our flight left Chicago at 5 am on Saturday morning and arrived in Salt Lake not long after 10 am local time. Since we had to wake up at about 2:30 am (and I slept for approximately 40 minutes because I was too anxious about oversleeping), I was in no form to ski for a whole day. But by the time we got to the hotel, grabbed a quick lunch and put our skis on it was already after 1 pm and we only had a few hours of skiing left. Getting my ski legs back before diving into a full day of skiing was great. We skied at Park City Mountain Resort a half day on Saturday and again on Monday. Park City has a good variety of runs including lots of easy green runs and a lift that serviced almost entirely expert black and double black diamond runs and bowls (which I avoided like the plague) and plenty in between. I liked the fact that they had a lot of double blue "advanced intermediate" runs that had some easier bumps or moguls for me to practice on that were not as challenging as the deep ones found on black runs. On Monday, we took a complimentary mountain tour with mountain host, Chip. Chip took us up to several different peaks, pointed out historical sites, and shared great stories. This really helped us get a better idea of the layout of the resort. On Saturday when we skied, Matt and I felt like we were stuck going down the same few runs on repeat and couldn't figure out how to get to different mountain "zones" so this tour was a good help. Unfortunately, we got stuck with a few slower skiers in our group (Matt and I like to ski fast) and Chip didn't get to take us everywhere he wanted. He did, however, give us a few good suggestions on places we should ski for the rest of the day. On our tour, we went up the ski lift chair with a woman who was 80 years old and still skiing. I was and still am thoroughly impressed both because she certainly did not look 80 and because she is 80 and still skiing. I hope Matt and I can still take ski vacations when we are 80 years old. Please knees hold out till then! Starting off as a mining town, Park City mountain still has a lot of old mine towers and such on the mountain. It was very neat to see and hear about. And because I am not afraid of a little self-humiliation I will share another story with you. In the afternoon, I started to feel pretty confident over-confident on blue runs and easy bumps and so we decided to head over to a black diamond run. Stupidly I picked a run right next to a lift so everyone could share in my embarrassment. Turns out the bumps were a lot more dished out and steeper than I noticed from the bottom. Which ended up in a huge fall where I went flying forward face first and my skis stayed up on top of the mogul. Unsmooth. Getting a little too worked up on the fall and how difficult the hill was, I ended up falling again. Then I was just mad. Thankfully the bottom half of the run was much easier than the top and I made it down without any more incidents. Um yeah, ego check. Park City also has night skiing on a select few lighted runs. We had planned to go on Monday night, but we were so exhausted we couldn't convince ourselves to go back to the mountain once it was dark and we were all cozy in our hotel room. I would consider Deer Valley to be the fancy-smancy resort in town. They actually limit the amount of lift tickets sold for each day (a host told us this number is based on the number of seats they have for lunch so everyone can have a place to sit), but thankfully this was never a problem for us. 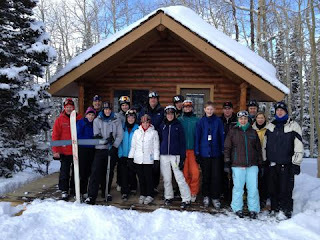 We skied at Deer Valley three days-Sunday, Thursday and Friday. I absolutely loved skiing here. Deer Valley has really great customer service and all the people that we came into contact with were very friendly. Even though some of them gave me a hard time about my Packer's hat. I had no idea so many Bears fans lived in Utah. Spending our first Valentine's Day together in over 5 years. We took a complimentary mountain tour here as well and it was perfect. This time the group was split into two--faster skiers in one group, leisurely paced in another. Mountain host Mike took us to almost every peak in the resort. One thing I really liked about Deer Valley is that it is easy to get from one edge of the resort to the other in only a few runs and ski lifts. The whole resort is easily accessible. Mike pointed out some great areas that we might want to explore later and took us down great runs. I can't recommend taking one of these free tours enough! Sunday afternoon we also had a great opportunity to attend a Christian service in Sunset Cabin. Matt and I joked that we were "so much closer to God" at 7000 feet. It was a great time to take and reflect and I especially enjoyed the message as we headed into the Lenten season. The pastor also spoke about taking in the beauty of the mountains while we were visiting. It reminded me to be very thankful for the opportunity to visit the mountains and that I am healthy and able to ski. This service is definitely an opportunity to take advantage of if you are skiing at Deer Valley. The pastor even took a picture and sent it to us. I am going to let you in on my top secret method for skiing long mogul runs: ski all the way to the side of a bowl and cut diagonally across the bumps so you don't need to turn at all. Then you will already be over halfway down the run and only have a few more bumps to do. This saves your legs and saves me from a heart attack. I skied Empire bowl like that every time and is probably one of the reason why I liked it so much. The first time Matt and I skied over into Ontario Bowl it is possible that I freaked out a little bit. It was deep moguls and had lots of trees and I did not want to ski down. I honestly thought about turning back around and hiking out, but I figured the easiest way down was to ski. I did end up falling once, but it wasn't too bad. Skiing through the trees is a lot of fun. I absolutely loved skiing at Deer Valley and found out I really don't miss the snowboarders (Deer Valley is ski only). The views are spectacular and the skiing is great. I loved that there were places we could ski that made me feel like I was the only one on the mountain. On Friday, we dined on the mountain at Empire Lodge. Since it was Friday, we weren't eating meat and therefore couldn't eat our usual packed turkey sandwiches and carrots like all the other days. My coworker had warned me that Deer Valley was super expensive, but it was still a bit of a shock. For two bowls of soup and one panini, no drinks it was $28. I realize this isn't outrageous, but it probably cost about $20 to buy the groceries we needed for sandwiches and carrots for the other 4 days. On our very last day of skiing, I managed to ski all day without falling! A fact that I didn't dare say out loud until I was safely out of my skis. This is also the say day that Matt crossed in front of me after the chairlift somehow crossed his skis and tumbled. The moment was pretty hilarious especially since I got to watch the whole thing happen. Several people suggested that we try to ski in Salt Lake City one day and I ended up finding a great deal for transportation and a ski lift pass through Canyon Hop. Alta is definitely less of a tourist spot and less of a beginner's mountain. Alta had the best snow out of the three resorts that we visited, but also the worst marked trails. The unmarked trails didn't bother me too much, but several times I ended up on runs that were more difficult than I had intended to ski on. Matt and I split up more on this day and he was able to ski in some tougher bowls and chutes. At this time, I also became convinced that I only fall on moguls when Matt is with me because I did a bunch without him and was absolutely fine. We also saw a porcupine at which a young Brit boy exclaimed, "Look father, look at the furry animal." Except I don't think he would be so furry if you tried to pet him. Can you spot him on the right side of the pine? The day at Alta went by the fastest of all the days we skied. I was so sad when we had to get off the mountain and into the van. I'm always amazed at the number of connections you can make with people that you just met randomly. On the second ski lift we went up once we were in Park City our very first day, we met a young guy who grew up in Cedar Rapids (right next to where Matt lives now) and used to ski at Sundown. Matt used to work at Sundown as a lift operator and that is where we both learned to ski. The guy also told us that his friends referred to it as "rundown" because ski hills in Iowa and most of the Midwest are pretty sad compared to the mountains. Cue it's a small world after all. My skiing definitely got better as the days progressed and I am much more confident now. But I will tell you skiing takes it out of you. I was exhausted by the time Saturday rolled around because we had skied the last 6 of 7 days. Both of it were feeling it in our legs and we even foam rolled with beer bottles one night. When I was flying down the mountain, it felt like my quads were on fire! And I didn't realize till Monday when I tried to run again that my glutes were very sore as well. I feel like I am still recovering from this trip. And I am glad to be home, but I already miss Utah. And I'll end with my ski vacation mantra. The worst day skiing in Utah is better than the best day of skiing in Iowa.